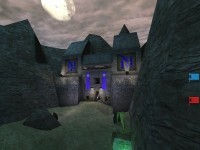 Some (CTF) maps are not created equal. 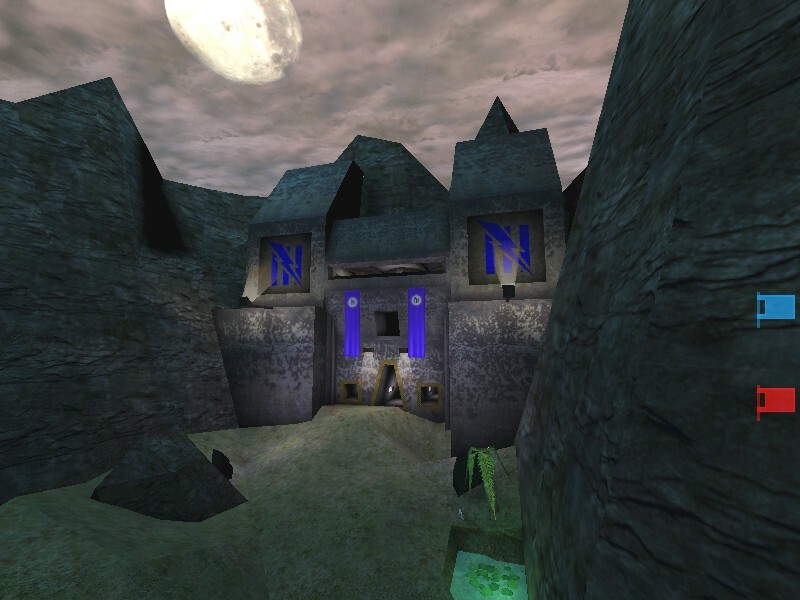 CTF-DarkAges attempts what most Capture the flag maps shy away from, an unsymmetrical layout. The Blue Base is a modern concrete construction (Hydro16) while the Red Castle harkons to a bygone era (Shanes Chuch). If looks were everything this map is above par with nOOb efforts. The use of UT terrain and acceptable trim levels gives this level rich atmosphere coupled with supporting soundFX. Light sourcing adheres to the surrounding architecture and both bases have their own continuity about them.Most of the base brush work is copied to preserve as much equality as possible. Perhaps the most difficult to balance is gameplay. The Red base is favored by the close proximity of the Shield Belt located on a bridge in no mans land. The Blue base is perhaps a bit more defensible with the access to the flag more verticly challenged and the sniper post better vantage over the approaching valley. Regardless, playability has a positive feel due to abundant Z, good item placement and game specific flow. In summary, DarkAges has a bit of the rennaisance in it, challenging the paradigm of symmetry in both time and space, it nearly accomplishes the impossible. Perhaps not a master, yet deserving a spot in any collection. Looks good. But i'm waiting to the review. EDIT : Oh my god!!! This is marvelous! This one can't not be in my offline CTF rotation. It's just that damn good. This is a good map. stay out from behind the mountains. other then that, not a bad map. A solid map. Simple layout but it works. Play is better than I thought it would be. Definately a keeper. A damn good map. Super job. ooraleeee!! !...esta bueno este mapa,vale la pena tenerlo en la colecci�n. nacho compadre, no te has fijado en ke aki no habla espa�ol ni cristo? When within I found a conflagration. I discovered it was mere instagib gyration! Awesome map! I don't like a unsymetrical style, but what the hell, its a keeper! Keep it the good work! I was a bit skeptical when I first saw this map but, it all turned out ok in the end. The map has awesome lighting. The theme is really cool too (kind of a past/present clash in 2 castles). This was a good download. The only thing that I can critique on is that the bots seem to spawn a bit...oddly. Besides that, it's awesome. Ignore the score, this map is horrible. Nice map considering its not symetrical. I really dont mind asymetrical maps as long as they dont give a team a too big of an advantage. This one doesnt so its good with me =P. The only thing i really didnt like was the terrain, I thought it was too hilly and should of been more flat, or maybe thats just me. The author did a good job with the lighting. He also did a good job on the bots, i didnt notice any problems with them. There were a few un-fairness's but there always will be in asymetrical map. What i noticed(which was said in the review) is that red is alot closer to the sheild belt. It is kinda hard to tell with bots but it would seem like blue can defend their flag better(you have to take your choice of 2 ramps up and your very predictable). Its a good map and i hope the author keeps up the good work =P I play alot of his maps on servers like CTF-Sprinta and CTF-Indusrage. The puddle causing damage was a quick fix for bots being stuck in there, there's no reason to go down there anyway so it didn't have too much of a negative effect. I decided to rate and comment on a few of my favorite maps to draw attention to them. There's a lot of great maps hidden in the vaults of NC that many people will never get to see, and this is one of them. 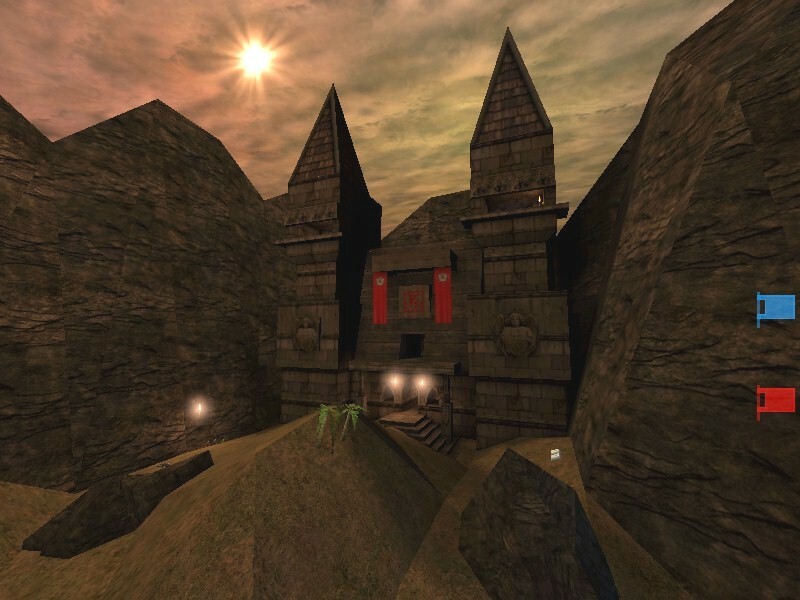 CTF-DarkAges is a map I never seem to grow tired of. While its theme and layout isn't really very original, it has that extra something that makes it a blast to play. The bases are not too big (which is often the case with larger maps) and the outdoor area has a lot of strategic possibilities. The bots work great and put up a helluva fight at the proper skill setting. 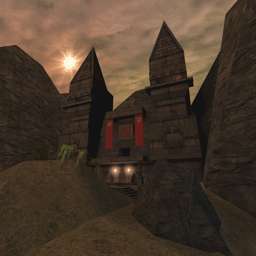 As for looks, well, CTF-DarkAges is a perfect example of the fact that a UT map doesn't need six billion polys to look good. The architecture is tasteful and effective and the terrain looks good. At least as good as terrain in UT is likely to look without slowing the map down. As mentioned in the review it has some balance issues though, the blue base being a lot easier to defend, but once you've played it a couple of times you learn to work around that (if you're on red). The placement of the redeemer is brilliant; if you translocate up there on your way into the enemy base, you can clear it out in seconds and then jump down and grab the flag. The screenshots above doesn't really do the map justice since they're too bright and washed out. It really looks much more atmospheric in-game.